WHY MUST NIGERIAN PARENTS ACT THIS WICKED? WHY WOULD THEY COMPEL TWO CHILDREN: 15 AND 11 YEARS TO EMBARK ON ‘DRY’ OR RELIGIOUS FAST AGAINST THEIR WILL? The death of Ayanfe, the teenage elder son of Kehinde and Titilayo Omosebi has now led to the arrest of the deceased parents, now clamped into jail. 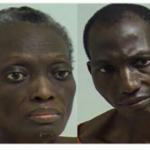 Police in Wisconsin have arrested a United States based Nigerian parents Omosebis following death of their 15-year-old son. Ayanfe, their teenage son reportedly died from a religious fast declared by his father, which also left his younger son, another 11-year old child hospitalized. Sensing his son his dead, the 49-year old father had voluntarily gone to the Reedsburg police station on Sunday to report his son’s death. When the police arrived the house, Ayanfe was found dead at the family’s residence. The police chief Becker said the father told police he was a minister affiliated with Cornerstone Reformation Ministries. He said that the family started a religious fast which lasted for 44 days before the boy died. Sonny Hyde, pastor of the Cornerstone Ministry Baptist Church in Reedsburg, said he does not know the family as they are not affiliated with his church, and he has not heard of Cornerstone Reformation Ministries in the community. Police said the parents would be remanded in custody on “possible charges of neglecting a child causing death and neglecting a child causing great bodily harm, until they appear in the Sauk County Circuit Court”. Meanwhile, the 11-year-old is said to be in protective custody receiving care at the Children’s Hospital in Madison, the capital city of Wisconsin. The Reedsburg police chief said the parents are now eating while jailed in Baraboo, a city in Sauk County, Wisconsin.